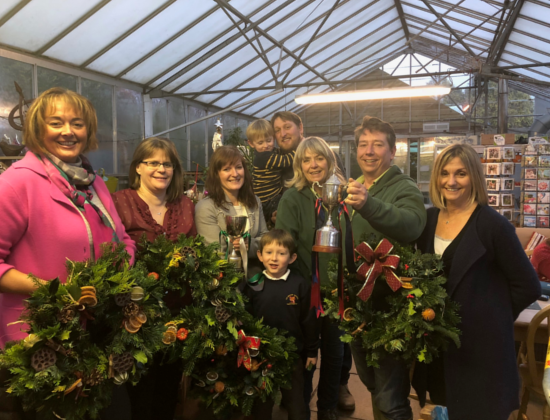 There is a great sense of satisfaction that comes from making something yourself, and Christmas offers a great opportunity for that special handmade adornment or card.Garden Time hosted a festive wreath making workshop to celebrate the festive season with partners South Hams Fencing & Landscaping and Marchand Petit. Guests enjoined a wonderful afternoon of demonstration and guidance in making Christmas wreaths, later decorating them in their own unique style. Whilst enjoying mulled wine and mince pies in Garden Time’s cosy glass café. So, make purchasing your Christmas tree an occasion and extra special at GardenTime. They have a huge range of local freshly cut and container grown trees. With a large variety of trees to choose from, including ‘no needle drop’. Free delivery throughout the South Hams and £10 ‘Money off’ voucher with every Christmas tree purchased.